To be hosted at the Mall of Asia. More details to follow. Hosted in the Blue Leaf Filipinas, this new venue in Metro Manila is a proof to the authentic and unique architectural sophistication of the Filipinos. 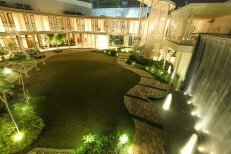 It offers its quiet minimal style and unmatched serenity, with a pavilion which blends nature and modernity, creating a perfect backdrop to the Routes Asia 2016 Networking Evening. The venue is perfect for an enchanting and fun evening which will definitely be remembered for the blaze of both traditional and modern music and dance.